Coffee and tea in an urn. 6 ppl minimum. Includes all fees. Bottled water per person. 6 waters minimum per order. Sandwiches, salad and sweets tray. 6 person minimum per person. Includes all fees. Assorted sodas. 6 person minimum. Choice of hot or continental breakfast, with juice and coffee included. 6 person minimum. All fees included. 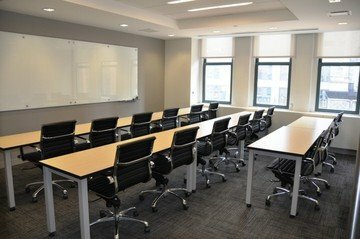 This intimate meeting space removes the temptations and distractions from your meeting - allowing your colleagues to remain focused and sharp. This traditional meeting space for rent is ideal for regular to bigger-sized groups of up to 16, to host a presentation, seminar or meeting. For any kind of company looking for an offsite room which focuses on professionalism, this is the perfect place to be. 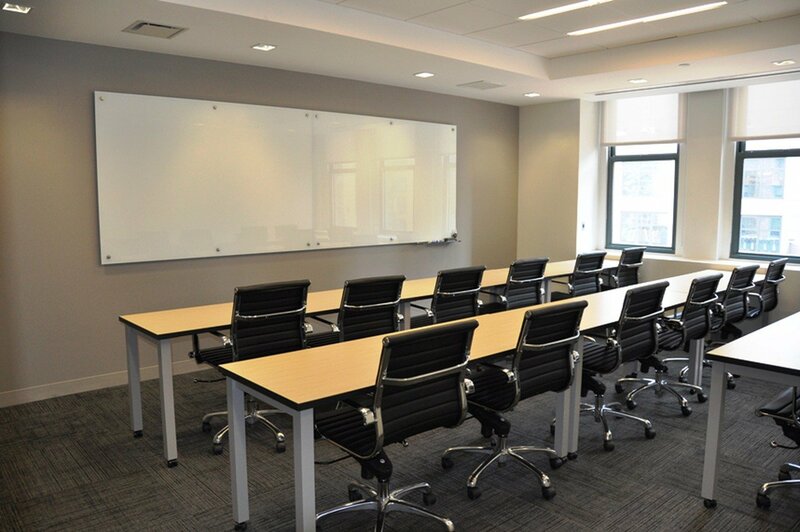 Complete with a flipchart, projector, screen, and phone conferencing, your training session is sure to be a success in this amazing meeting space in NYC. Besides all this technical equipment, we also have plenty of options regarding catering, as you can for instance choose to kick off your meeting with a breakfast with your team or have a pleasant break including our delicious lunch. Naturally, we can also provide you with several drinks during the day, at an additional charge. Reaching the NYC meeting space is rather easy and convenient, as you can make use of many public transport possibilities. Take for example subway lines 4, 6, N, Q, R, W, B, D, F or M and you will only have to walk a few more minutes to reach the meeting space in NYC. 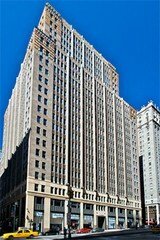 If it’s easier for you and your guests, you can conveniently arrive at Pennsylvania station and also only walk for a few minutes to reach it. Located in Kips Bay, the meeting space is surrounded by many bars and restaurants, as well as many NYC famous hotspots, perfect for any out-of-towners. For instance, if you walk for a few minutes, you will automatically see the impressive Empire State Building. Your guests from out of town also have plenty of choice regarding accommodation, as for example the Roger and Pod 39 are within walking distance. Weekend and evening bookings would need to be approved in advance. The weekend / evening rate is 150% our normal rate. There is a 4 hour minimum on the weekend.